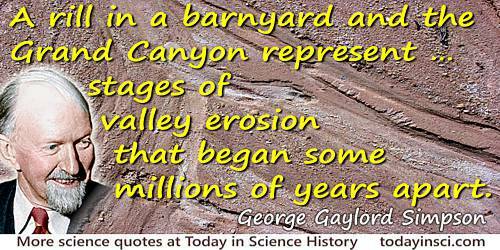 A rill in a barnyard and the Grand Canyon represent, in the main, stages of valley erosion that began some millions of years apart. Uniformitarianism. An Inquiry into Principle, Theory, and Method in Geohistory and Biohistory', M. K. Hecht and W. C. Steere (eds. ), Essays in Evolution and Genetics in Honor of Theodosius Dobzhansky (1970), 83. It’s like trying to describe what you feel when you’re standing on the rim of the Grand Canyon or remembering your first love or the birth of your child. You have to be there to really know what it’s like. [About Carlsbad Caverns:] It’s just the Grand Canyon with a roof over it. Syndicated 'Daily Telegram' No. 1496, 'Mr. Rogers, On Mother's Day, Takes ‘Ma’ for a 7-Mile Walk', (10 May 1931). For example, printed in 'Rogers Takes Ma For Underground Hike', The Milwaukee Journal (11 May 1931), 1.